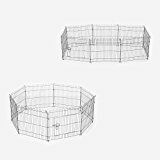 This pet cage is suitable for dogs, cats, chicken, pig, guinea, rabbit and hutch. There are 8 steel panels connecting with metal buckles. Each panel can be fixed with ground pegs. The Door has 2 bolts for secure locking. It is suitable for being used as a secure play area where your pets can play and jump outdoors without worrying. This entry was posted in Small Animals and tagged 42inch, Cage, Crate, Fence, GUINEA, INDOOR, Kennel, Metal, Outdoor, Panel, PawHut, Playpen, Puppy, rabbits by One Boutique. Bookmark the permalink.